Experience better living the Jeevaniyam Ayurveda way to be the witness to the positive healthy changes in your life…..
An Inner View: Jeevaniyam is the journey into a new enriched nourished healthy life. At Jeevaniyam Ayurveda Hospital & Research Centre Kochi, India our mission is to ensure in what we believe by steering you confidently through the paths and leading you to a wholesome and healthy life. We work towards the accomplishment of our mission through our qualified, dedicated and experienced team of experts from varying disciplines ever ready to assist you in your quest for a natural Ayurveda way of living and natural Ayurveda Treatments for chronic ailments plaguing and crippling your life. The Motivating Force: The founder of Jeevaniyam Ayurveda Dr. Reshmi Pramod an accomplished alumnus of VPSV Ayurveda College Kottakkal inherits the legacy of centuries of Ayurveda practice from her traditional Ayurveda practitioner ancestors. Equipped with 13 years of experience and the orally transacted wisdom of her predecessors she excels in preventive, palliative and curative aspects of General Ayurvedic Medicine, Panchakarma Therapy, Clinical Yoga and Hospitality. Facing and determinedly defeating the challenge posed by her weakened eyesight with professional excellence and futuristic career vision she has risen as the role model both as a person and as a professional. Over the years, Dr. Reshmi Pramod has carved a special high place for herself and has attained fame nationally and internationally, as a provider of personalized Ayurveda based integrated health care treatments with a scientific approach. Jeevaniyam Centre for Autism and Learning Disorders Management is the unique special facility and one of the topmost in quality among its kind. The centre has been dedicatedly and successfully treating children with Autism, ADHD, Behavioural Problems, Learning Disorders and Cerebral Palsy enabling them to reform physically, psychologically and helping them to integrate themselves into their respective environments creating their individual identities as prospering individuals. The holistic management and ayurvedic treatment schedule of an integrated combination of Ayurvedic medicine, Child Psychology and Clinical Yoga helps the child and parents to regain the self-esteem and move ahead positively in life. Years of research by Dr. Reshmi Pramod and the expert guidance by stalwart advisors like Dr. Dinesh KS Associate Professor In Kaumarabhritya (Paediatrics) has made the centre the “Centre of Excellence” for the treatment of Learning Disorders, a fact endorsed by satisfied children and parents. Jeevaniyam Ayurveda Wellness Management: Jeevaniyam Ayurvedic Panchakarma Treatment Centre and it's Hospitality Services cater to the domestic and international tourists spending their vacations leisurely in elite starred hotels and resorts. Integrating the essence of Ayurveda, Yoga and Meditation in a contemporary yet traditional establishment our Ayurvedic Therapies provide instant stress relief and sustained rejuvenation. Our flexible, highly efficacious, suiting the needs, pampering feel good programs offered at our Jeevaniyam Ayurveda Hospital and Research Centre, Thammanam Kochi, Ashwini Hospital and Maternity Centre Kollam Koyilandy Kozhikode and all our affiliate centres functioning from various high end hotels, resorts and retreats offer 1 day, 3 days, 5 days, 7 days and 10 days wellness packages for general wellness, detoxification, relaxation, rejuvenation, skin care, beauty enhancement, stress and overweight. Our programs are named Sukharogya, Sukhayus, Kayakalpam, Navajeevanam, Punarjeeva, Shareerakanthi, Navajwala and Dridagathram. Jeevaniyam Ayurveda Yoga: At Jeevaniyam Clinical Yoga and Research Centre (Jeevaniyam-CYRC) trained and qualified Yoga practitioners join hands with experienced Ayurveda doctors of Jeevaniyam Clinical Yoga and Research Centre for designing the Clinical Yoga modules which are systematically taught through simple and effective techniques like breathing, relaxation, meditation and Yoga postures. Diet Counselling, Reflexology and Ayurveda Abhyanga Therapies also are part of Clinical Yoga Programs. Lifestyle is the answer to the menace of non-communicable lifestyle disorders that are accounting to the morbidity and mortality of the population. Our Jeevaniyam Ayurveda Lifestyle Awareness and Clinical Yoga Training Programs are Yoga Retreat Program, Clinical Yoga Therapy for Diabetes, Clinical Yoga Therapy for Weight Reduction, Clinical Yoga Therapy for Back pain and Joint Disorders, General Yoga Training For Kids and Yoga Trainers’ Training. Jeevaniyam Ayurveda Illness Management: Jeevaniyam Ayurveda has always strived to provide the best possible Ayurveda therapeutic care to the patients suffering from various ailments such as Rheumatic Ailments, Arthritis, Back Pain, Metabolic Disorders, Woman and Child Health Issues, Skin Diseases and much more. Basing the diagnosis on the Tridosha concept of Ayurveda and adhering strictly to the prescribed Panchakarma procedure with perfect Poorvakarma and Paschatkarma we offer 3-5-7-10-14-21-28-35 days Ayurveda Treatment Programs. Jeevaniyam Ayurveda Life Style Clinic offers effective management plans for diseases like Computer Vision Syndrome, Stress, Hypertension, Diabetes Mellitus, Dyslipidemia, and Overweight/Obesity associated with Cardiovascular Diseases and other major Life Style Disorders which are on the rise globally. The clinic also treats Hyperthyroidism, Hypothyroidism, PCOS and other life style diseases which are classified as Metabolic Diseases. Swasthavrutha, Ayurveda Diet, Yoga, Meditation, Sustained Exercise Regimen and Lifestyle Management Counselling are the management protocols for Lifestyle Diseases. Jeevaniyam Ayurveda Spine, Neck-Back and Joint Care Clinic is the expert care centre for sustained pain relief, improvement in mobility, healthy weight, tissue nourishment and strengthened support system. The long term results are better quality of life, prevention of disability, delayed natural degeneration of body tissues and healthy ageing. Jeevaniyam Ayurveda Stroke Rehabilitation Clinic: Quality recovery, improved lifestyle, independence in activities, revival of confidence and feeling of reassurance in life are our goals achieved through our stroke rehabilitation programs at Jeevaniyam Ayurveda Hospital & Research Centre. Jeevaniyam Ayurveda Women Health and Infertility Clinic: The clinic is the preferred destination for women seeking a healthy natural active way of life through Ayurveda and Yoga. Our women centric programs understand the value of womanhood and parenthood. 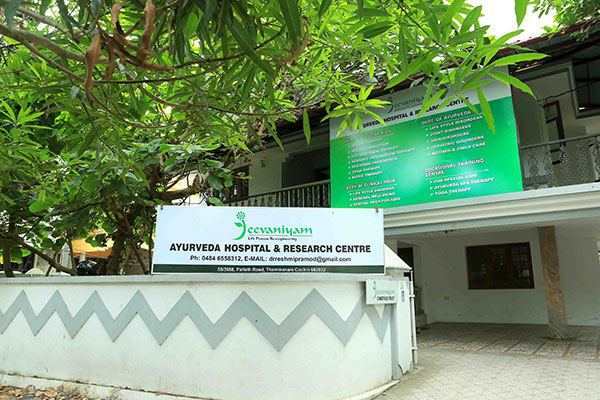 Hence we provide a complete, quality obsessed general, gynaecological, obstetrical and infertility care incorporating the principles of Ayurveda and Yoga. Jeevaniyam Ayurveda CSR Activity: Jeevaniyam Ayurveda Charitable Trust is the socially responsible and committed initiative of the institution for the bright future of children with special needs. We provide Language therapy, Occupational therapy, Music therapy, Special Education, Yoga Audio-visual Integration Therapy, Early Intervention, Parental Training and Counselling Programs both to the Special Kids and their Parents. The activities are patronised by liberal donations by the kind hearted and concerned persons socially committed for the cause.